The Joyful Hermit is watering the few remaining orchids and a slew of other houseplants today. Just stepped outside the garage with the blue bucket and loaded it with the quickly melting snow. Brought in the bucket, set it on the rug by the utility area, and await the snow in the bucket to melt. Plants love snow water. 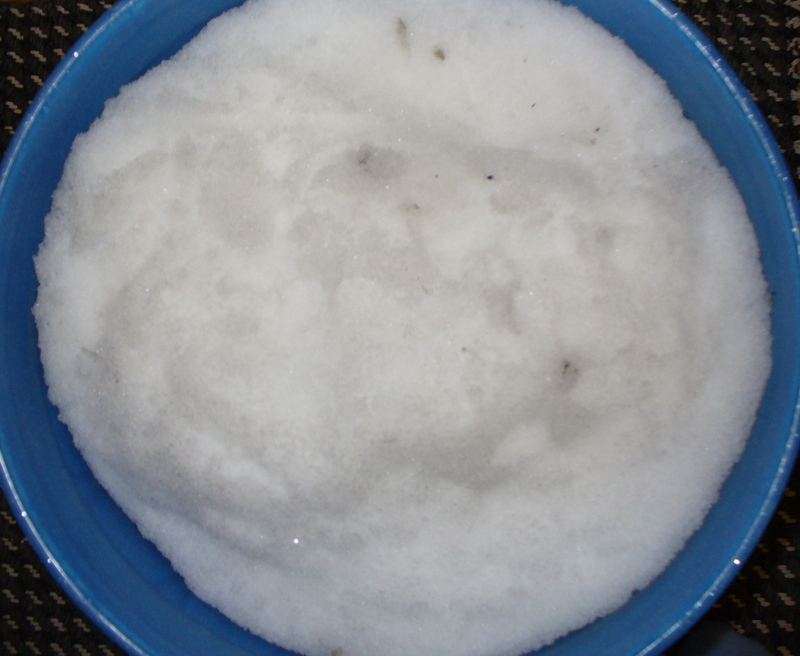 Once melted and room temp, some plants in their containers, such as orchids, can be set right down in the bucket of snow water. Allow the potting medium to become saturated. Remove the pot and plant, and repeat the process. For large potted plants, simply dip a plastic cup (Joyful Hermit uses an old measuring cup with pouring lip), and water the plants in their pots by gently pouring water all around the soil and plant base. Be innovative in types of basins placed under plant pots. Joyful counted on a clay basin only to find that the moisture did seep onto the wood flooring. Handled the slight mold but definite discoloration to the wood by moistening a paper towel with chlorine bleach water, then wiped the discolored flooring and let the sun streaming through the window complete the bleaching. The next day I over-wiped the same area with wood polishing oil…and replaced the clay basin with a plastic plant basin found in the garage. Today I plan to add some generic plant fertilizer into the snow water. The plants being wintered over are looking as if they could use one last boost until spring–still some weeks away. 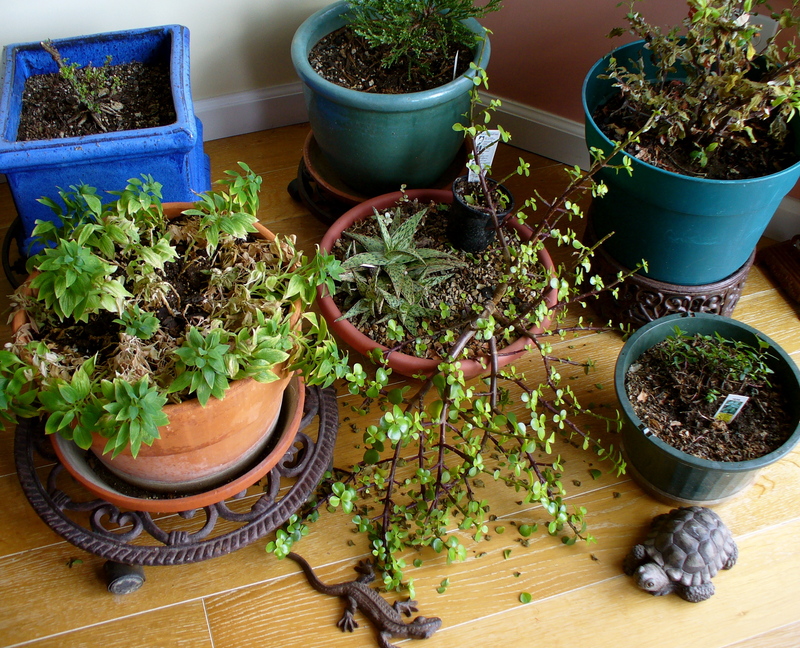 Now and then I also clear away any of the dried and spent blooms and leaves. Get ready to vacuum, for it is not a neat process no matter how clever one attempts it. For those who do not have snow to utilize for house plant watering (or in the warmer weather here), the Joyful Hermit sets out buckets and even a stainless steel pot to catch rain water. Particularly efficacious to plants (and I drink it from stainless steel pots) is water collected during a lightning storm. No snow, no rain? 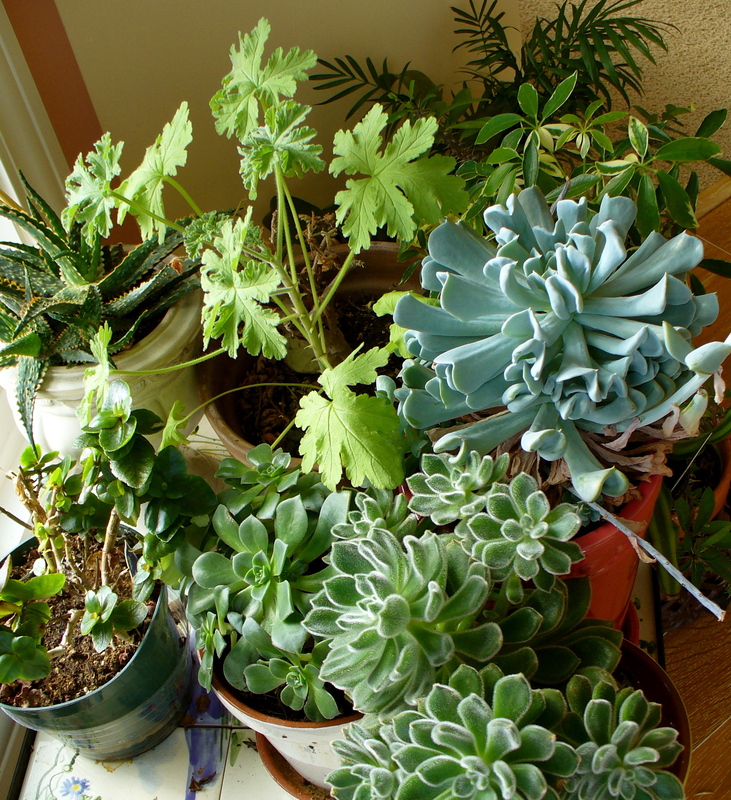 Use tap water or filtered, but don’t use soft water, obviously, for plants. The salt content is a killer. If your water ranks high in hardness, and you are truly keeping the houseplants’ little veins close to your heart, let the tap water stand in your watering container for a day before watering the plants. Find out water hardness from your city or township water provider. Come spring, The Joyful Hermit is going to check with the local water department and hope to get a free rain barrel for garden watering this year. If they are not giving these rather basic, unattractive, white barrels for free, I will take a budget risk and invest in one I’ve researched on the internet. These barrels attach to the house downspout…and will lower what last summer’s drought heightened in budget-busting water bills.